As summer holidays loom, I’m sure that many of you are looking forward to that slower time of year in which space can be found for ‘other things.’ Many I know look forward to some summer reading; and with that in mind, I thought I’d offer a book recommendation this month. Against the backdrop of the numerous books written over the last two years that debate God and religion, I am therefore delighted to have recently read what I consider the best modern defence of Christian belief. 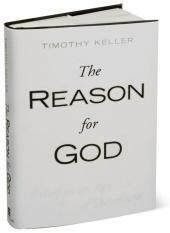 Dr Timothy Keller’s ‘The Reason for God’ really is quite superb. It is on the New York Times bestsellers list and is already being called ‘a modern classic.’ He properly understands and engages the struggles many today have with Christianity, and he does so with a model of gentleness and respect. The second half of the book gives an overview of basic Christian belief, whereas the first half answers the major objections Keller finds people raising: Christianity and other religions, the problem of suffering, whether Christianity is repressive or responsible for injustice, the difficulty we have with the idea of judgement, whether science has disproved Christianity, and whether the Bible can be taken literally. The book needs to be read thoughtfully. However Keller has a knack for putting complicated things simply. Whatever your current convictions, I do hope you will invest in a copy. The reason for God is soon to be published in the UK by Hodders, but can currently be bought from Amazon or from the Good Book Company (0845 225 0880). If you wish to order it from a book shop, it is published in the US by Dutton (ISBN 978-0-525-95049-3). When one considers the huge claims of Christ and the impact they have had on world history, I hope it is not too much to suggest that it is wise for everyone to carve out some time at least once in life to properly consider those claims. As the sun shines this summer, I do hope you might string up a hammock, find a comfortable spot under a tree, and take in this great book.